The Sven Saw Original 21" Folding Saw is a serious everyday saw that is a highly prized piece of camp gear that folds up very compact in your backpack or Bug-Out bag. Get a Sven Saw and a reliable fire starter and you can make shelter and fire in the woods. This compact saw cuts through small and medium branches and trees quickly, it is light to carry, and easily fits inside or on the outside of your survival Bug Out Bag. It is a fast and efficient way to get your firewood into smaller, more manageable pieces. The 21" Sven Saw weighs approximately 13 ounces and in the folded position, the blade is completely protected from cutting you or your gear. Paint the wing nut orange or another bright color in case you drop it in the woods. Also, add a flat washer under the wing nut to make tightening it easier and to protect the aluminum frame. "Best Camp saw bar none! I own 2 Sven Saws, a 15' and a 21'. I bought the 15' for backpacking and the 21' for canoe camping, in either case it turned out the 21' is light enough for the pack and I really don't use the 15' much any more, but I still keep it on hand as a backup. Hands down this is the best bow style saw you'll ever own. I've used many different saws, you'll never get me to waste my time with one of those cheap folding saws and axes and hatchets are far too heavy and require too much effort to use. Sven's are durable, easy to pack, safe for you and your gear when folded yet sturdy and quick to assemble when needed. The blade is sharp, very sharp and cuts 3' and 4' logs with ease. I've even cut down 10' diameter trees with this saw." "An essential tool for the woods. I have used a 21" Sven Saw for many years while backpacking, and it is my most highly prized piece of camp gear. Give me my Sven Saw and a reliable fire starter and I can make shelter and fire in the woods. If you camp, whether backpacking or car camping, get one: they are light to carry, pack away easily, and are the best thing I have found for cutting wood, period." "Purchased to take on a recent canoe trip. Worked great and cut faster than the guides folding hand saw. It works best when you do not put too much pressure on the blade and let it do its work. With too much pressure the blade will flex and go off course. This is to be expected with a blade that can only have a limited amount of tension applied. When folded the blade is protected and will not cut other items in your pack. I had no concerns packing this in my dry bag....I have used this on 4 more outings and it has become a trusted tool. It has held up and I do not expect performance to change with added use." "There are perhaps hundreds of different camping saws to choose from, so I had a difficult time choosing one to use for backpacking. I chose this one based on the recommendations of other Amazon users, and I'm glad I did...."
"I've kept one in my pickup for years and often take it out for kayak and motorcycle camping and backpacking. It's good for medium firewood but due to the triangular frame you have to shorten your strokes as you saw into bigger wood unless you can rotate your sawing around and then you can get through 1' dia. logs." "One of the best products I've ever owned in any category. I bought my 21 inch Sven Saw back in the mid 70s for backpacking and I still use it (with the original blade) around my farm for jobs too small to fire up a chain saw. Just last week we used to to cut back tree branches that were threatening the shingles on the roof and today I used it to trim back a heavy bush that is growing up by the mail box. I keep it by the front door because it is so useful, and it is very compact when folded and incredibly light. It's easy to throw in a car or truck and the triangular shape makes it a very efficient cutting tool - easy to get into hard to reach places. Everyone who has seen my Sven Saw over the last 35 years has wanted one. A friend who does disaster relief work is thinking all their workers should have them for easy brush removal in situations where they can't get in heavy equipment. 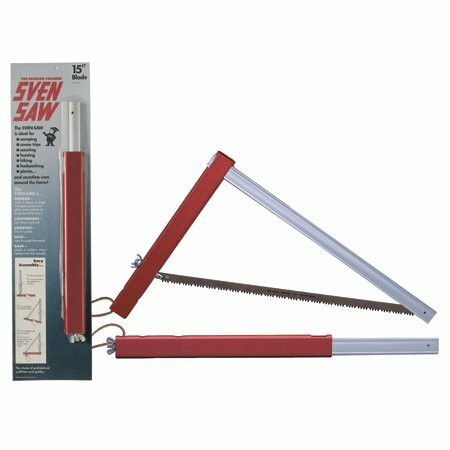 If you're considering getting a Sven saw, don't consider it any longer, just buy it. Your only regret will be that you didn't have it sooner." The following YouTube video is a review and demo of the Sven Original 21" Folding Saw. The following YouTube video is another review and demo of the Sven Original 21" Folding Saw. This video shows the saw cutting a seasoned hardwood tree limb approximately 5" thick in slightly under 1 minute per the start and stop time on the video. Use at your own risk. Please note that the information provided on this web page is for information only. TopSurvivalPreps.com and it's owner have no liability or responsibility for anyone using any items described on this web site including the Sven Saw Original 21" Folding Saw.